Prairie Paws Animal Shelter can MicroChip your pet !! Just come on in during business hours. Call us at 785-242-2967 for pricing (currently $15.00 plus tax) and watch our Facebook page for specials. Most of the dogs and nearly all of the cats entering our Shelter are without proper identification. Did you know that according to a study conducted by the American Veterinary Medical Association, dogs are 2.5 times more likely and cats are a whopping 21.4 times more likely to be returned to their home from a shelter if they have a registered microchip? This life saving process is affordable and easy to do and can make the difference of getting your pet back home. Dog and cat microchipping is a simple procedure. 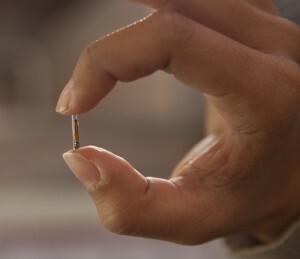 A medical professional simply injects a microchip for pets, about the size of a grain of rice (12mm), beneath the surface of your pets skin between the shoulder blades. The process is similar to a routine shot, takes only a few seconds, and your pet will not react any more than he would to a vaccination. No anesthetic is required. 1. A microchip does NOT store any of your information. The only piece of information that that a microchip contains is a unique nine, 10, or 15-digit number (think of it as your pet’s social security number). In order for the microchip to work, it must be registered in an online registry like the free Found Animals Microchip Registry. Without a registration, the microchip is just a useless piece of internal jewelry for your cat or dog. An unregistered microchip in a pet is extremely hard to trace back to the owner, and a busy shelter may not have the time or resources to track down that information. Remember: the registration needs to be updated if you ever move or change your phone number. If you pet came microchipped, it is always wise to check to see if your pet’s microchip is registered, you can use AAHA’s pet microchip lookup tool. This useful tool tells you if/where a microchip is registered. AVID and 24PetWatch do not participate in this tool. If AAHA’s website points to one of those suppliers, we recommend calling those registries directly to see if your pet’s microchip is registered with them. 2. A microchip is NOT a GPS. You cannot locate or “track” your pet with its microchip. Microchips are “passive transponders,” meaning they don’t contain any power source, so they have no way to let out a signal when your pet is lost. In fact, the chip doesn’t do anything at all until a scanner is passed over it. That’s when the microchip uses the energy produced by the scanner to emit a unique code, which then appears on the scanner. Another main reason a microchip cannot be a GPS is size. To add a power source to the microchip, you would need to add a battery compartment inside the chip (making it a lot larger than the current injectable size), and your pet would need to be “plugged in” to charge, sort of like an electric car. Pet GPS collar tags are available, but thankfully, they’re worn on the outside. 3. Not all microchips and scanners are “universal.” Microchips in the United States operate on one of three frequencies: 125 kHz, 128 kHz, and 134.2 kHz. Some manufacturers provide microchips in more than one of these types. The 125 kHz is the oldest U.S. frequency, and is still distributed by AVID, HomeAgain, and 24PetWatch. The 128 kHz is the rarest frequency, and has only been distributed by the AKC. The 134.2 kHz is the ISO International Standard chip, which is the frequency that Europe, Canada, Japan, and most parts of the world are already usi ng, and that the U.S. is slowly moving towards. Most U.S. suppliers now provide ISO standard 134.2 kHz microchips, including Found Animals, Datamars, ResQ, HomeAgain, AKC, 24PetWatch, Bayer, and 911 Pet Chip. A universal scanner must pick up all three frequencies. This is where people tend to get confused. Some shelters and vets assume that if their scanner picks up three different brands of microchips, it is universal. However, as you can tell from the above, some brands are on the same chip frequency, and some make several different types of microchip. So unless the scanner picks up all three frequencies (the 125, 128, and 134.2), it is NOT universal. And unfortunately, many organizations are unknowingly still using non-universal scanners, which means they are missing chips and therefore unable to reunite lost pets with their families. 4. You can register any brand of microchip with any registry. AND you can register a microchip in multiple registries. For example, if your pet has an AVID microchip, you can register it with HomeAgain, AKC, and Found Animals. But here’s where this may cause a problem. Say your pet’s microchip is an AVID chip, and you register it with HomeAgain. If the shelter sees that your pet’s microchip is an AVID chip, they may call AVID to see if it is registered, and if they stop their search there, the other registrations may never be found. So unless they use AAHA’s pet microchip lookup tool to expand their search, your pet might never make it home, even though you kept your registration up to date. On top of that, registries in the United States are not required to speak to each other or share owner information, so shelters that don’t search microchips online would theoretically have to call every single microchip supplier one by one to determine where it may be registered. (See how this could get complicated and potentially deadly for your pet?) Most organizations do not have the time or resources available to wait on hold with all of the common microchip companies. Because there is no singular national database in the United States, some owners choose to register their pets in multiple registries as an added safety net. Some for-profit registries will charge a fee to register or update your pet’s info, but as long as all registrations are kept up-to-date, there is no harm in registering in multiple registries. The Found Animals Microchip Registry is a free non-profit service, and will never charge a fee to register pets or update your information. 5. 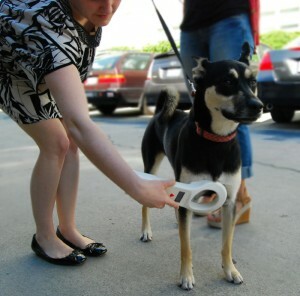 A microchip is NOT the way most pets get home. Yes, a microchip is your pet’s only form of permanent ID. Yes, it is a great way to protect your pet. Yes, every pet should have a microchip with current registration information. However, the quickest way for your lost pet to get home is with a collar and tag with your phone number on it. This tag should also have the pet’s name and microchip number on it. Never underestimate the power of an external ID tag – it’s visible and easy for people to understand, which means even a first-time pet finder should know how to contact you. Of course, external ID can still fall off or be damaged, but if you pair an external tag with permanent microchip ID, your pet will have two solid layers of protection to get him home. You can get customized tags at most pet supply stores.